The resurrection of the Joe Walsh Guitar Face post was trending popular yesterday so I spent some time looking for another artist being “caught in the moment”. Here is a great one from Prince. If you have any “Guitar Face” photos you would like to submit for future posts, email them to DJ@GuitarDaddy.com. I really understand the guitar face. We see it all the time. What I find really interesting is that, just by looking at the face (without seeing his hands on the fretboard, etc.) I can tell what is being played! 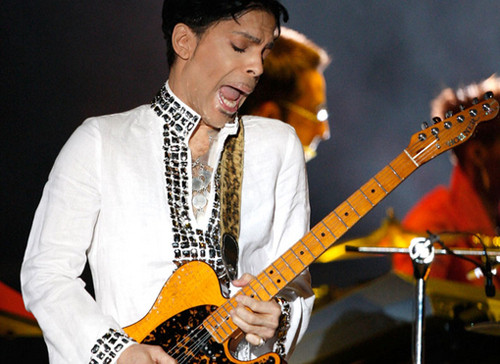 For example, Prince is playing a long, sustained, vibratoed, note that is bent up at least a full step or more. His expression looks like he is singing that note. Now, Joe Walsh has this crazy, twisted, funky look on his face. That can only mean a really cool, unexpected, twisted, dischordhal, double stop that is so funky you just love it when he resolves it into something sweet. Guitadaddy…if you have a couple more, why don’t you post them and we can then try to see if I, or others can describe what is played based on the facial expression.